We can provide pretty much any kind of dance class, dancing event or dance workshop. It's completely open ended. You tell us what you need and we will come up with an appropriate dance solution. Below is just a brief sample of the type of dance solutions we have provided and could provide for you. We have included these just to give you a taste of what you may like to have, or to give you spark for an idea of something different you'd like. Ballroom is great for a fun yet sophisticated dance class. They are all partner dance styles so participants will dance as couples. We will ensure that everyone swaps partners regularly to bond the whole team together. This is probably our most popular class. Classes are normally around 2 hours long. How about we teach you a routine to a song and not tell anyone! 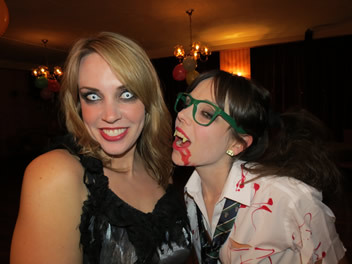 On your corporate event/night you can then jump up and dance an awesome routine to your chosen song. Jaws will hit the floor! A twist on this is to have one of our teachers there and they 'randomly' pick you to do a dance... which ends up being epic! We'll get everyone dancing with everyone as you swap partners as the lesson progresses. You'll learn some of the basics and put the moves together as you go. Who doesn't love cheesy disco tunes?! Line Dancing isn't all Country & Western styled these days. You can line dance to plenty of modern pop songs too. Standard dance classes are based on a chosen dance style or to learn a routine to a song. Disco dancing is great for small groups. Salsa and ballroom are the most popular style for the larger classes. Line Dancing is great for a 1 hour class or event (it can be longer, but it is tiring). Prizes - Quite often our clients also like our teachers to give a prize to the best male & best female (you can supply the prizes). Very popular dance workshops for the larger corporate events are our Ballroom Dancing - Strictly Come Dancing - Dance Package and our Line Dancing Dance Class. 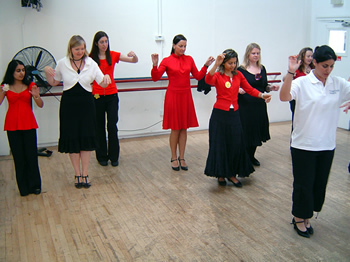 For a Mediterranean feel how about our Flamenco Dance Workshop. For smaller groups how about our Disco Dancing Dance Classes. From 1 to 4 hours in length and catering for 1 person through to 300+ people. They can be held pretty much anywhere, from a dance studio to a hall or ballroom (even outdoors). A financial company in London had an end of year party at which 5 directors had to do a choreographed routine to 'The Time Warp' from the Rocky Horror Picture Show. An accountants, also in London, had a corporate entertainment weekend away near High Wycombe and required a dance teacher to do dance lessons throughout the weekend for different groups who then competed against each other on the final evening. An IT company in Reading has put on weekly dance lessons for employees to learn to dance. A client had a weekend jolly in an exclusive venue for it's top consultants and required 6 dance teachers to provide 3 different style dance workshops. They then had an X-Factor type competition at the end with directors as judges. One off dance workshop on a week day evening. Dancing competition - We show you, then you copy what you saw, and we (or you) then score the results. Call us up and we'll be more than happy to chat to you... 0845 055 0729.